In the age where internet has managed to take over most of our lives and times, the job services have also been greatly influenced by the same. There were times when people had to go from place to place to look for jobs in various professions of their choice. However, with the internet and the moving of the people into the world of quickness, one is able to find appropriate jobs according to their preferences and choices in abundance on the internet. The use of job boards to acquire employers as well as employees has caused a great deal of improvement as well as problems in the corporate industry. However, with times improving and moving forward, it is necessary for people to take up the changes as they come in and deal with them in best ways possible. However, with niche list of job sites there may be chances of the job websites creating various issues for both the people who are looking for employees as well as those who are willing to get employed. The results that come in after posting one’s job listing on the job boards can also depend a lot on the number of traffic that the board receives and the other critical information mentioned on the boards. Over all, there are a lot of advantages and disadvantages that a person, as an employer and employee may have to face while looking for jobs on the job boards. One of the most important advantages of a job board is that all the employers as well as employees can get in touch with each other when they are in need of jobs. Since, the number of people is high in any job board and with lots of unique job opportunities; one can contact and get in touch with the different types of employers and employees as per their needs and positions available. Another most important aspect of a job board website with a niche option is that there are a lot of options from which people can choose from and find exactly what would suit them best. 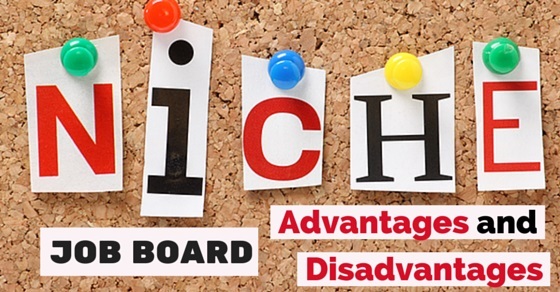 Since almost all company have listed themselves on the niche boards, people often than not are aware about various position opening along with the descriptions. With the large network of employers and employees, it is easier to find the perfect job or the perfect employee for the job with the help of job boards. In the usual ways of employing or finding the appropriate candidate, one has to go through a very time consuming and cost expensive path which may not be fruitful always. The niche job boards help in providing the employers with a list of employees looking for jobs in their field with their resume and other details much needed which incidentally helps the employers find the ones which they consider most effective for the job. Since the basic task of finding appropriate candidate has been fulfilled by the job boards, it is easier for the employers to choose among the short listed and find their potential candidate. The job boards which have more than one form of category, more often than not lose the applications or CV’s of the candidates. Since the number of people who log in is vast in such diversified portals, it is natural for various CV’s to get lost in the crowd of other resumes. Hence, when a person uploads his resume in a Niche job portal, there are lesser chances of it getting lost and hence, the chances of you getting recognized by a company in time of a vacancy are higher than what it is on a general job portal. Another main aspect of job boards is that it helps in networking. People from the same back ground and similar interests are able to get in touch with each other, hence the chances of making and creating something worthy is more. With niche job boards, networking is an important tool. As the employers are aware about the various candidates with good potential in various positions and they know where to look in case they need someone to fill in that position. The job boards are a good way of meeting people and networking which is always a good form of getting jobs and positions in the industry. Some people may be very good at communicating virtually where as some people may have a knack about creating a good impression if they meet a person face to face. Here job boards turn as virtual job boards that do not in any way provide one to one communications, it can pose a problem for various candidates as well as to the employers as just by looking at a person’s profile they are expected to shortlist him for the future interviews and select him as a potential candidate. One of the most probable disadvantages of a job board is that one’s resume may get lost in the job board. As a job board usually gets a number of entries every day and no matter if the job board is of a niche industry, it is always a possibility of losing one’s resume in the vast sea of resumes. This can cause to be a problem as if there are vacancies available for jobs which a person is interested in and if the employer is not able to connect with him because he has not got in touch with his resume, there are chances that he will not even get a shot at the job position. Since everyone and anyone can get information from job boards no matter if it is general or a niche job boards there are chances that the information provided on the job boards may get into wrong hands or there may be a breach of privacy. With the cyber crimes increasing on a regular basis, it is important for one to make sure that the information that he gives in his resume on the job boards is limited. However, some of the information cannot be kept from such boards and hence it increases the chances of breach of privacy. Usually, after a potential employee puts up his resume on a niche job board, his inbox is filled with a series of collective junk mails and advertisements regarding various get rich quick policies and things of similar value. Since junk mails and advertisements are a problem which may cause a lot of viruses or bugs to enter the system, job boards weather niche or general are usually responsible for them. Though there are chances that a person might end up with his dream job but he will also have to go through the junk mails and ads to get to that. Traditionally job boards are just job portals which connect the employers and employees. There is no sure short way of knowing if the employer or employee is being honest about his qualifications and interests. When a company goes to an agency to find them the right candidate, there is a person who gives the assuredly of honesty on behalf of both the employer as well as the employee. This makes it easier to trust and believe that the work will be done equally well on both ends and there will be no clash on interests. With the job boards lagging the human accessibility, they have a huge disadvantage over the recruitment agencies. With the internet forming the basis of the lives of all the people on the professional and personal front, the best job boards, both general as well as niche has managed to create a strong position in the lives of the employers as well the employees. With the advancement of the technology, it is important for all the people to accept and adapt to the changes and move along with it as they come. Next articleWhat to do when your Career is Going Nowhere?